My garden has a bumper crop of amazing lettuce, spinach, kale, and chard! It’s beautiful. But I am having a hard time trying to eat it all. Plus, we are leaving for PARIS in less than 24 hours and I need to figure out ways to harvest it before the summer heat and lack of watering kills it all. I have made a few things recently that are perfect for freezing for quick weekday lunches. Hope you enjoy! These were a big hit. 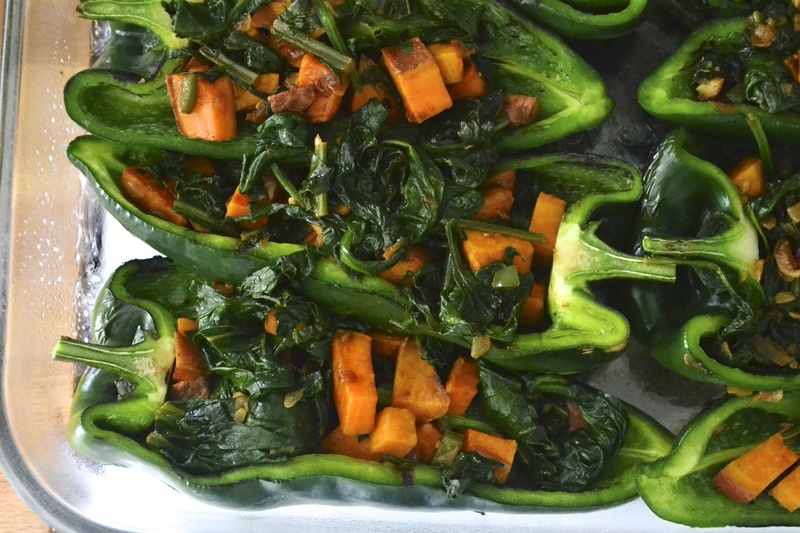 These Sweet Potato and Kale Stuffed Poblanos are spicy and very flavorful. Poblanos are easy to grow but also can be found in your local market. They are great for stuffing, given their large open cavity. I roast mine over an open flame on the oven before stuffing and baking them. It’s quick and easy and gives a great smoky flavor. Preheat oven to 350 F. Prepare a 9X13 glass pyrex with oil or nonstick spray. Set aside. To make the filling, heat olive oil in heavy skillet over medium heat. Sauté onion until translucent (about 5 to 7 minutes). Add garlic, jalapeño, sweet potato, paprika, and cumin. 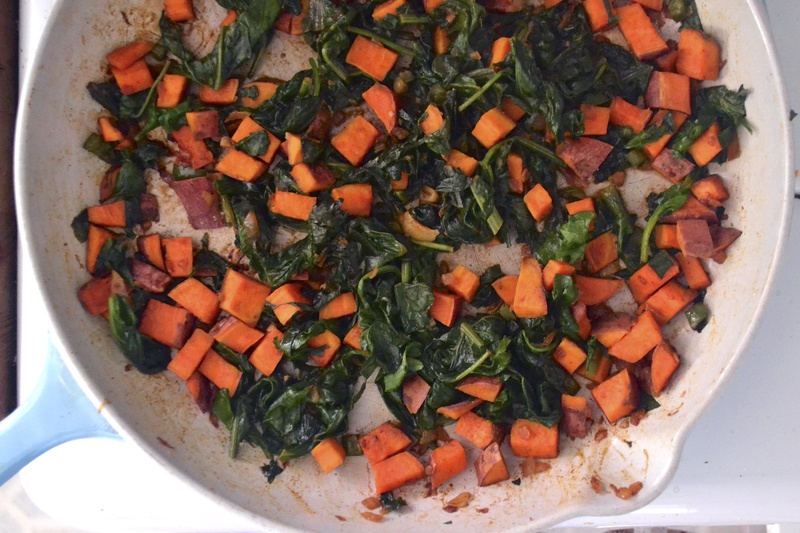 Cook, stirring frequently, until sweet potatoes begin to soften (about 10 minutes). Clean kale and remove stems. Don’t dry off. Chop into 1-inch pieces. Add to sweet potato mixture. Cook until kale is wilted (about 3 to 5 minutes). Remove from heat and set aside. Cut poblanos in half right through the stem. Remove seeds and rinse and dry thoroughly. 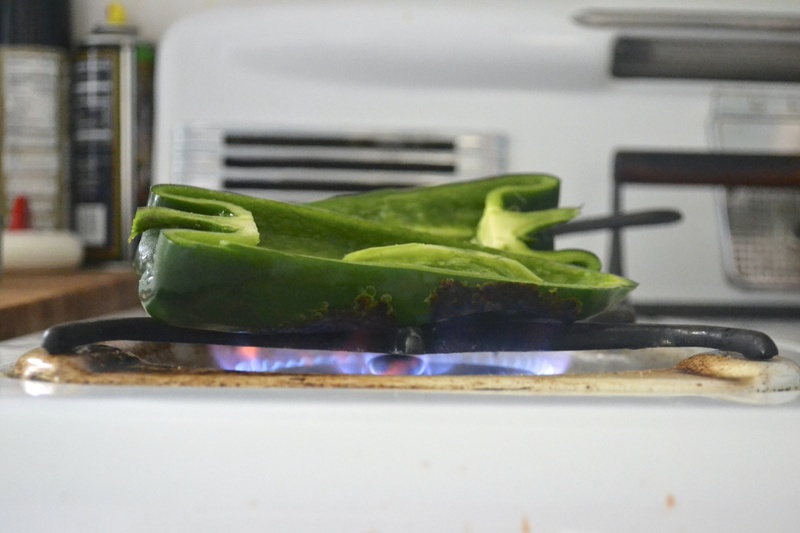 To broil poblano peppers in an oven, place the halves cut side down on a roasting pan. Place on the highest rack in the oven and broil on high for a few minutes until the skins are blistered. You can also do this using gas burners on your stove. 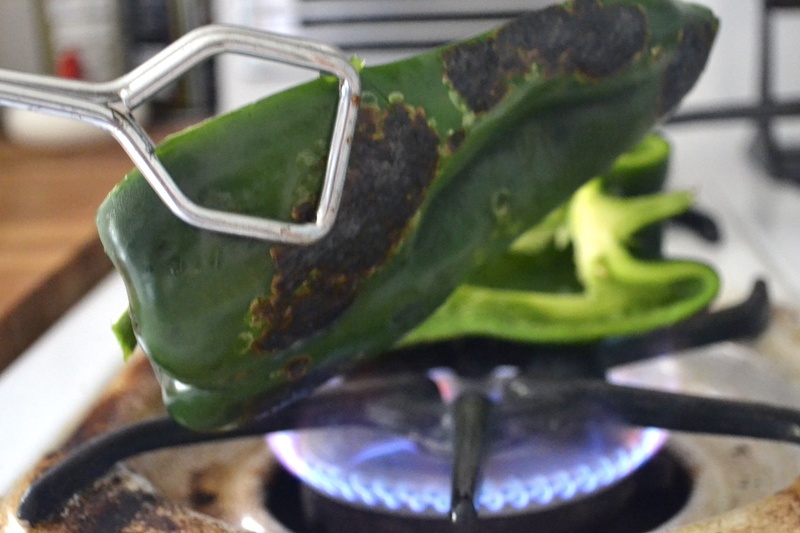 Place the poblanos skin side down onto the gas flame using tongs to turn. Remove when skin is well blistered, about 1 or 2 minutes per side. Place poblanos skin side down into the prepared pyrex dish. Spoon about 1/4 cup of the sweet potato-kale mixture into each poblano half. Bake for 30 minutes at 350F. Remove from oven. Serve with cheese (optional), avocados, cilantro, and salsa. Bon Voyage and Bon Appetit! Enjoy those fabulous Parisian cafes. Thank you! YES! I’m quite excited. I’m also incredibly excited about going to the Maille mustard boutique!!! I’m a total dork. awesome idea, i love the idea of sweet potatoes with spice! Love sweet n spicy too!! !